origin, Ile aux Aigrettes is made up of coralline limestone. 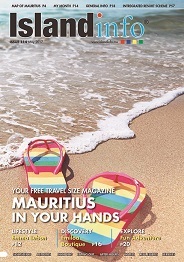 It is home to the last remnants of dry coastal forest, once found around most of Mauritius. efforts resulted in the restoration of the forest and reintroduction of rare species that had long since disappeared from the island. Visitors can discover Ile aux Aigrettes by joining any of the available tour options. The standard eco-tour which lasts between one and a half and two hours provides a guided trail around the sites of interest on the islet. The tailor-made tour should normally be booked in advance to cater for any special interests that the visitors might have, such as photography or bird watching and the length of the tour depends on their requirements. Upper primary and secondary school pupils can follow an especially designed Learning with Nature educational programme. them to its unique flora and fauna and explain restoration work being carried out by the Mauritian Wildlife Foundation. The last part of the tour leads visitors to some impressive life-size bronzes and paintings of a few extinct species of the Mascarene Islands in our museum. A small boutique offers interesting and attractive souvenirs for sale including T-shirts and caps, items embroidered with rare local bird and animal designs, children’s books and a whole range of wildlife-related products. The boat will then take you back to the mainland. Please note that eating, smoking and alcoholic drinks are not allowed anywhere on the islet, neither is littering. Visitors are required to remain on the trail at all times, within sight of their ranger, and are requested not to touch animals or damage/remove plants. To catch sight of rare birds it is important to keep noise to a minimum. Compliance with these basic requirements is crucial for a smooth visit. situated at the departures point on the mainland at Pointe Jerome. The departure times for the tours, leaving from the old Sands Jetty at Pointe Jerome are: Monday to Saturday – 09.00, 09.30, 10:00, 10:30, 13:30, 14:00 and 14:30 and on Sunday mornings only. plants and animals of Mauritius. Ile aux Aigrettes and Round Island, both of which contain highly threatened biodiversity of global importance.